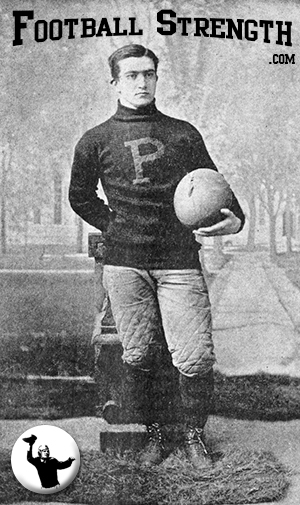 Seen here is Gresham Poe, one of the six famous Poe brothers, who led the Princeton UNiversity Tigers to many victories between 1882 and 1901. They were all related, albeit distantly, to another famous Poe, Edgard Allen, as in, of “The Raven” fame. This entry was posted in Roots of the Game and tagged Gresham Poe, Princeton University on February 5, 2014 by footballstrength_admin.